Here’s a new sweepstakes from Amazon! 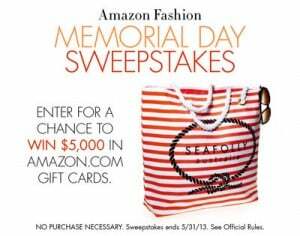 Click here to visit the Amazon site and fill out the form to enter their “Memorial Day Sweepstakes.” One lucky winner will score a $5,000.00 Amazon.com Gift Card. You’ll have until May 31st to enter this one. Good luck!